I stayed up way too late last night. I should have gotten to bed earlier, but I wanted to get certain things done online before I headed out again. I was up till 12:30am, and the alarm was set for 5:30am, but I was wide awake at 5am. I knew this would come back to bite me later in the day as 4.5hrs of sleep just wasn’t enough. We had to be up early to catch the 6am school bus that takes hikers back to trail up the other side of the Raitia River. The buses here tend to be more like the small tour buses in the US. It was a very comfy ride along a remote gravel road. When we got on the bus, Steve and Amelie were the only other hikers taking the bus this morning. We actually lucked out as this is the first day back to school after summer break. 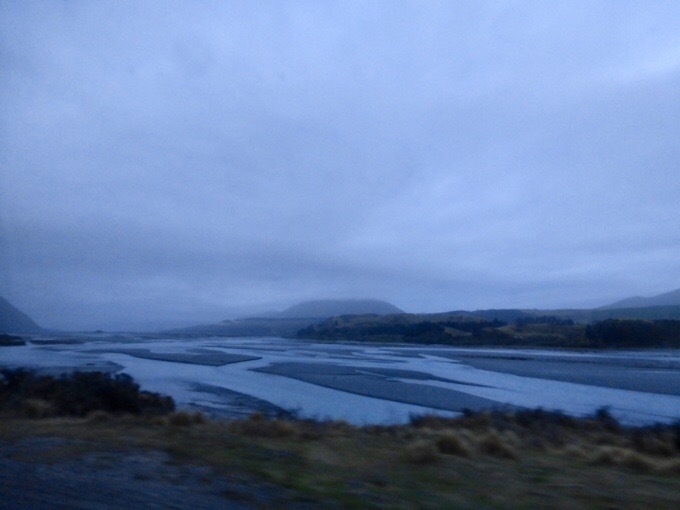 As we rode back to trail, we got nice views of the Raitia River. This driver has it figured out. 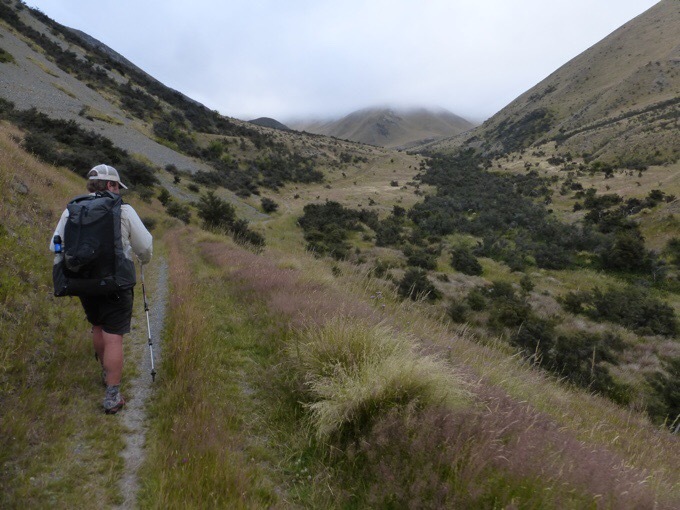 He takes hikers to trail ($20NZ/$15US per person) before his school route that goes back on that same gravel road. As he took us, he also stopped a few times to deliver newspapers. He has three overlapping jobs that he can do at the same time. Pretty nice setup! We arrived at the trailhead and set off to hike at 7:10am. The whole day was in wide open space with great views. 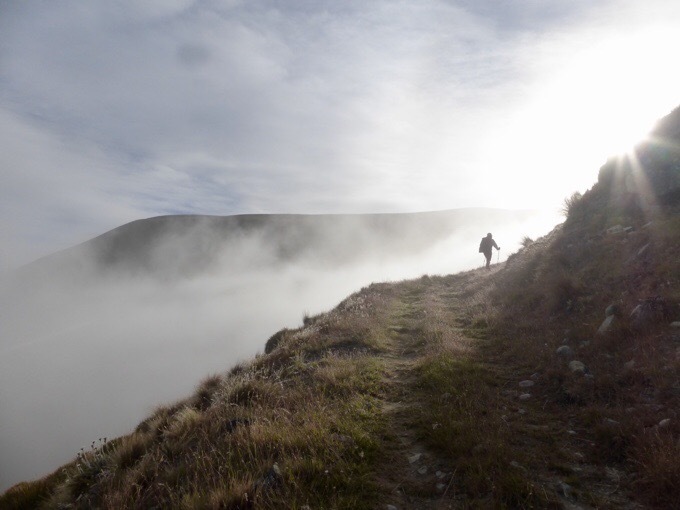 The morning started with a rising fog that perfectly lifted as we hiked up the gravel and dirt road to Turtons Saddle. 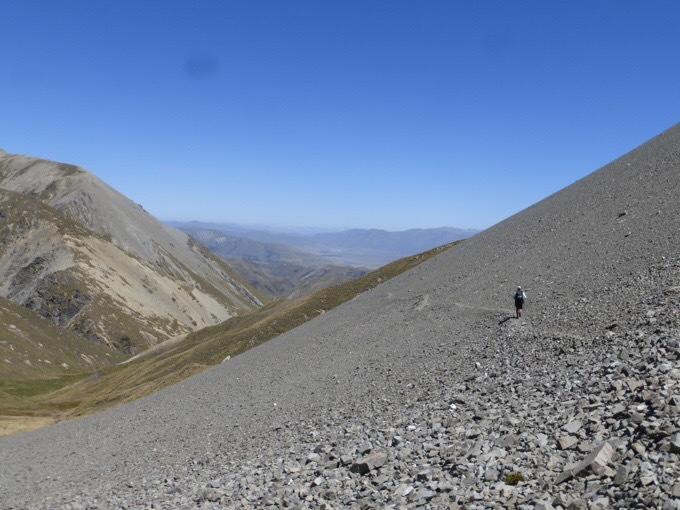 This side is so much drier than what we were in on the other side of Arthur’s Pass. In the logbooks at the huts, they have a column for people to note the weather when they were there. Rain was last noted by someone over three weeks ago. Somehow, this area may have dodged the weather bomb that slammed everywhere else. We thought the weather bomb term was only used by hikers, but we found out yesterday that it was actually called the weather bomb by the news outlets and weather forecasters. I will say this stretch can have lots of wind and we did experience that some the second half of today. After Turtons Saddle, we dropped down to Turtons Stream and other streams. The track follows the stream, that was more like a river for us, for quite awhile. 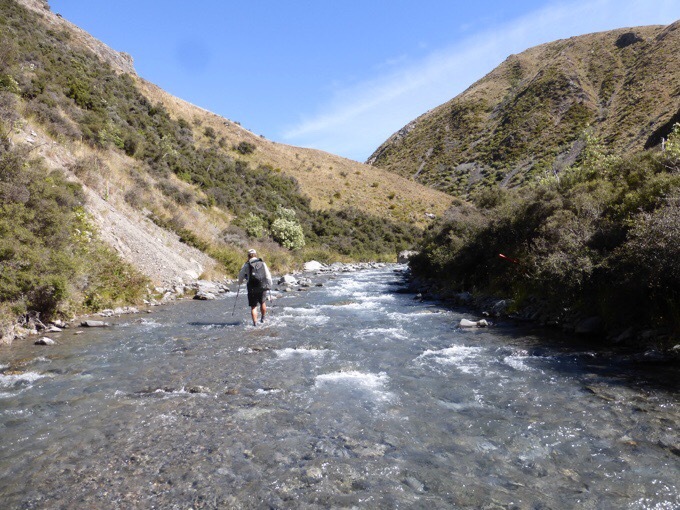 We had at few tiring hours along the stream that involved a lot of just flat out walking in the stream. I could see most years that this is a splash in the water and almost relaxing, but for us, we had to really focus and put in extra energy with how swift the water was. We saw one northbounder and passed three southbounders along the river. After the stream fun, we started the tussock portion of today’s obstacle course. We had a long tussock climb up to Clent Hills Saddle. 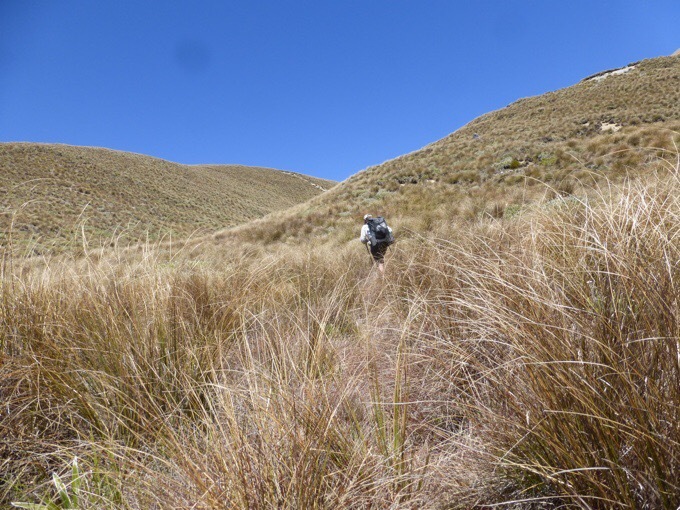 This tussock was quite high and it was near impossible to see what you were stepping on. With my weak ankles, this is quite anxiety provoking. Griggs flies through this stuff. It was pretty hot out and I was sweating quite a lot. 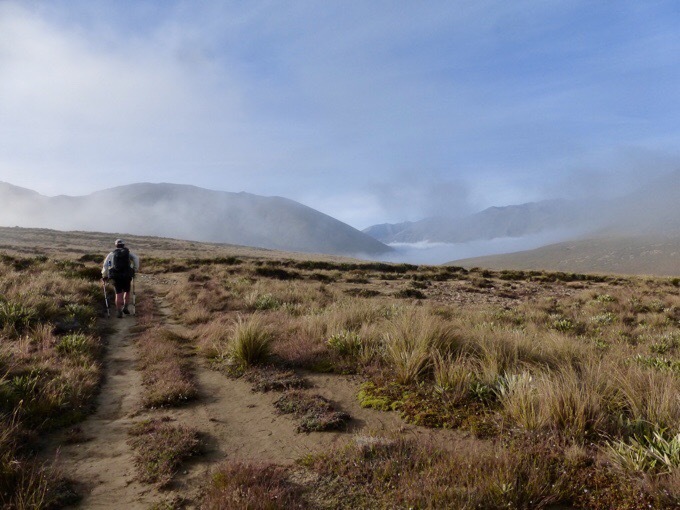 In the final steeper ascent, there were pockets of small streams and holes in the tussock. At one point, I unexpectedly stepped in a hole and my hiking pole collapsed a bit with the pressure I put on it. This happens from time to time and I continued walking and readjusting my pole. 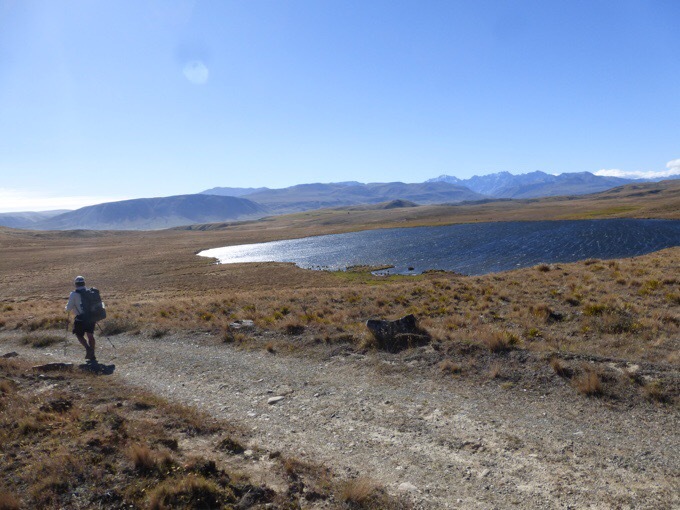 Walking in tussock is not great for multitasking, and I immediately lost my balance on another hole and fell over. I somehow fell like a turtle and was stuck on my back with my pack lodged in a hole. Then I realized the hole was running water and that it was drenching my pack. I was stuck on my back and couldn’t get up, so had to unclip my hip belt and get my arms out of my straps to get up. Griggs missed all this entertainment as he was up ahead a bit and I got his attention once I was freed. He came back down as I was repacking my pack to make sure everything was dry. Thankfully, nothing electronic got wet. Then I realized I couldn’t find my hiking pole that started this whole fiasco. It took some time, and Griggs found it somehow lodged down in the hole with the stream hiding under the tussock. Griggs did ask if we needed to recreate the turtle fall for a photo, but I thought once was enough. I was paranoid the rest of the day about my footing. 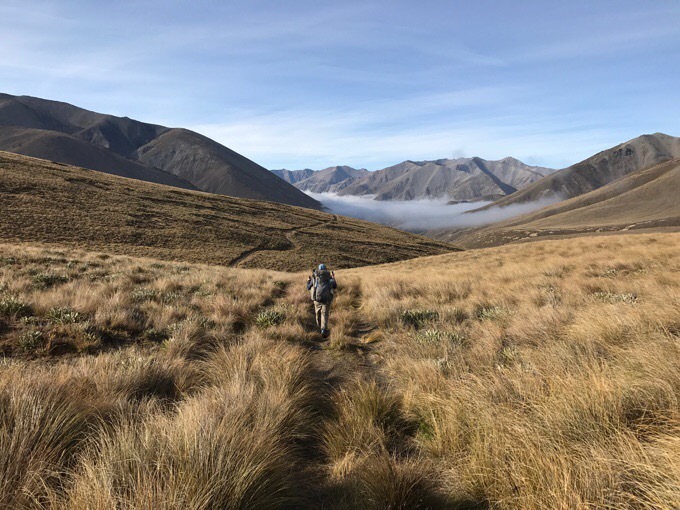 I do have to say that this is appropriate timing because Felix is just ahead of us and last night posted an outtake of a video he made in the tussock in which he totally bites it and fell in the tussock. It is hilarious and I reposted it on my Facebook page for everyone’s viewing enjoyment. Also, it can be viewed on the link here to Felix’s public Instagram @youcancallmefelix. That footage is pure gold! We made it to the top of Clent Hills Saddle and another hiker was there to take a photo for us. It may be tough to believe, but Griggs is enthused. Working on the photo extroversion! After Clent Hills Saddle, it was a cool decent with a great view and a mix of tussock and scree on the way down. 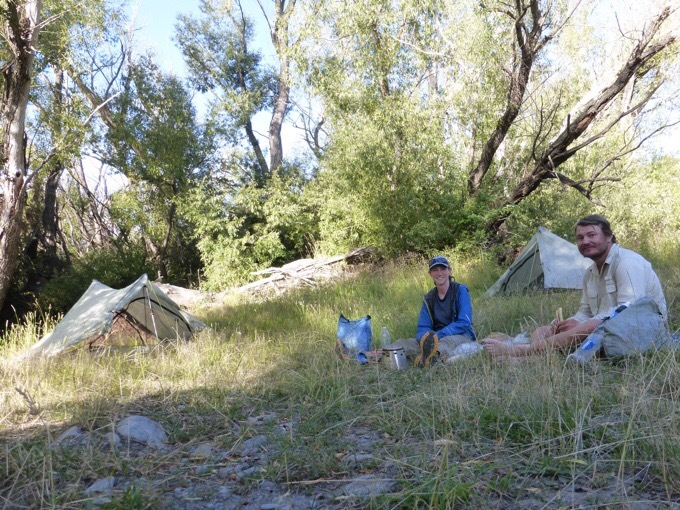 Our original plan had us stopping after 24mi/38km at the Manuka Hut. Weather was nice, and it was only 5pm when we got there. We texted my friend through that inReach to see what level the Rangitata River was at. 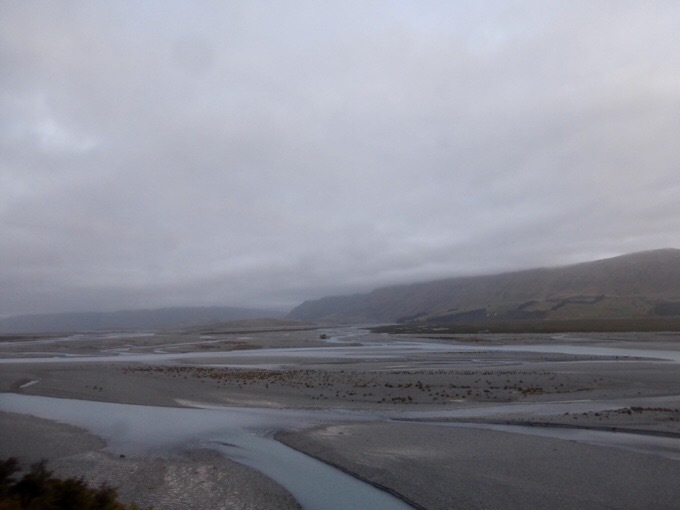 We were hoping it would drop enough for us to cross the multi-braided river tomorrow. We heard the flow rate should be lower than 80 to attempt it…it was 104. 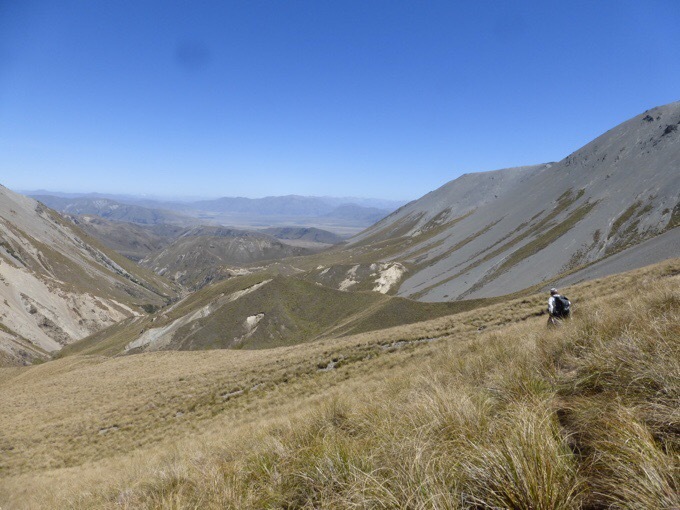 No Rangitata. That means we need to do another one of those circuitous hitches tomorrow, and this one may take 24hrs with how remote the second half of it is. We decided to hike further tonight to give us more time to hitch tomorrow. It was pretty easy hiking, so we were in the mood to cruise a bit more. 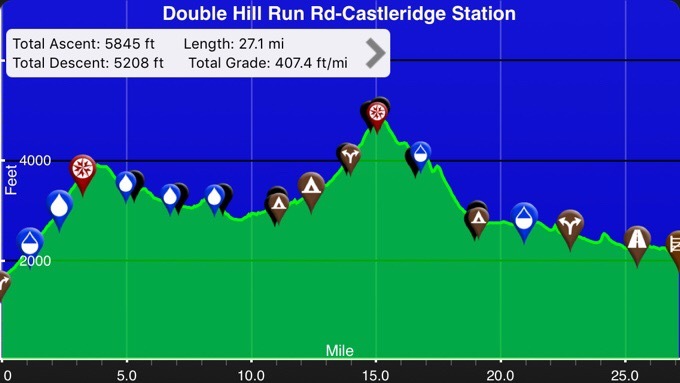 There was one small climb that made my bad foot quite angry on the descent and it hurt pretty badly for the rest of the day. 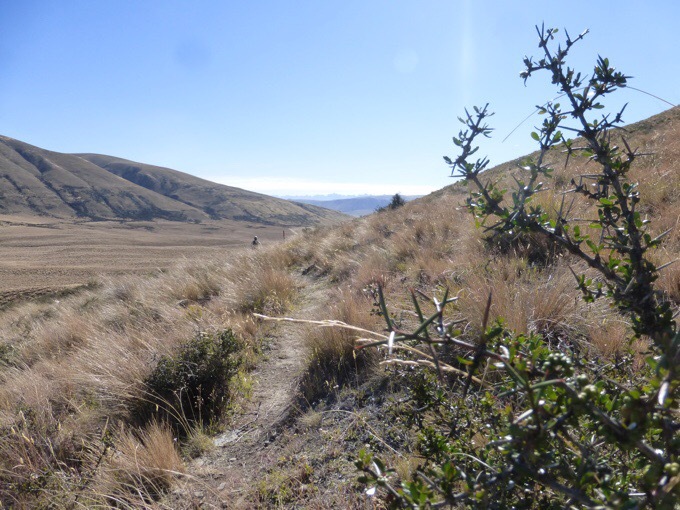 I will also mention that the tussock I this section has plants with spears and thorns that are terrible. I was happy to be wearing pants, but even pants are not much help. We had hoped to do another 6mi/10km to camp by a lake, but the wind kicked up and this section has hardly any trees. We walked up on a sheep shearing station and had that surreal moment where we had a good 15mins where a herd of sheep were next to us and kept running when we got close. 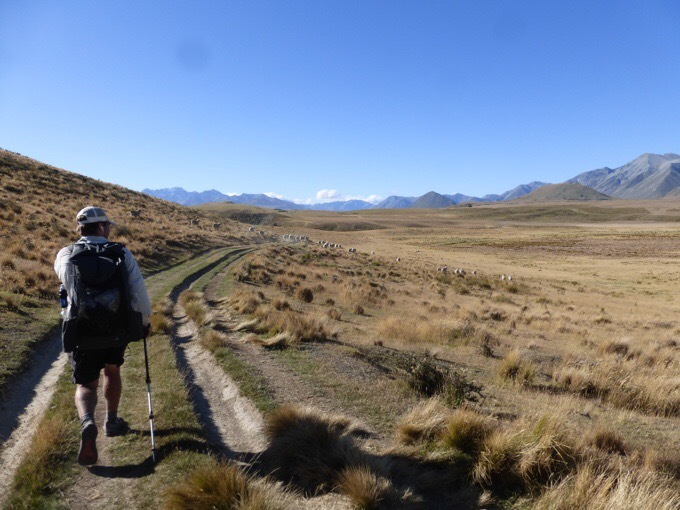 We had mountains and sheep all around us and it hit us that we were definitely in New Zealand! When we got close to the shearing station, there was a sheltered area with trees. It was earlier than we had hoped, but we decided not to push our luck with the wind. It was really strong and that patch of trees was a safe haven. We stopped for the night at 6:45pm and I finished the day with dry shoes! I think it’s been a couple weeks since that’s happened! Yes, we walked in a river for hours today, but I am celebrating that they were dry at the end of the day. Me too .. but how would boots have coped with all that water, I wonder? the thorny plants are Matagouri. capable of wrecking lightweight gear… one reason why kiwi gear tends to be heavy. 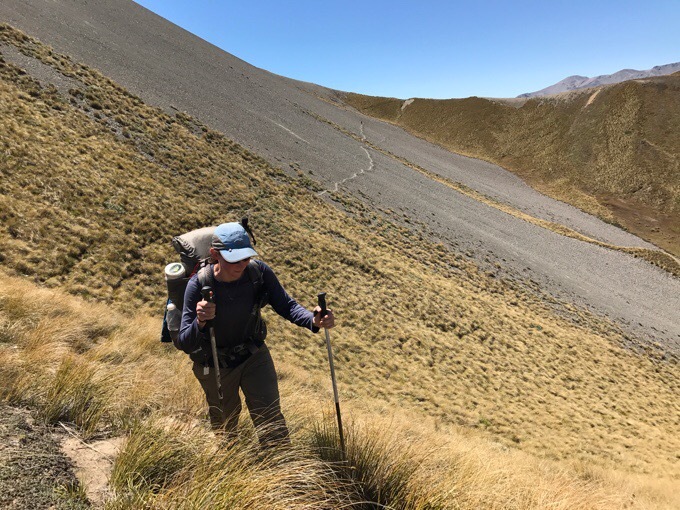 Beutiful pics wired, there’s no better way to hike then to just hike your own hike. If the critics could just realize this and just hike there own hike, all would be well. Enjoy your journey Wired. 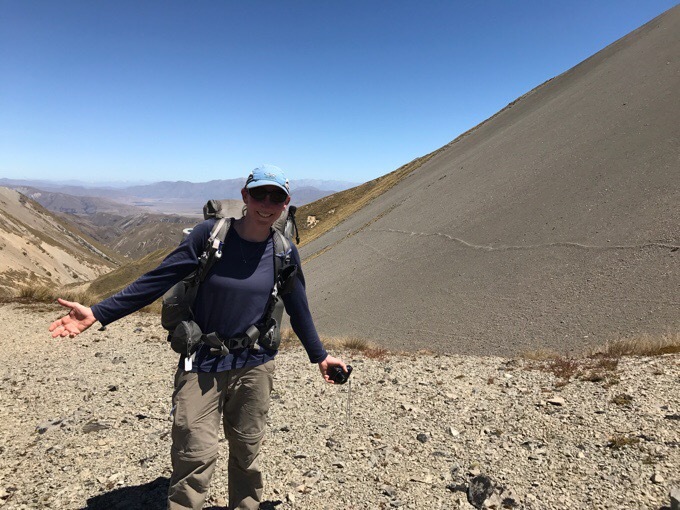 Wow, that’s one of the vastestest and uniformalistist scree fields I’ve ever seen. I bet turtles an tortoises would appreciate being able to unstrap their shells to make an escape at those times….